Christie's King Street (London), 'West-East - the Niall Hobhouse Collection', May 22, 2008; Niall Hobhouse collection until 2008, Hadspen House, Somerset, UK; reputedly from the Jai Vilas Palace, Gwalior. 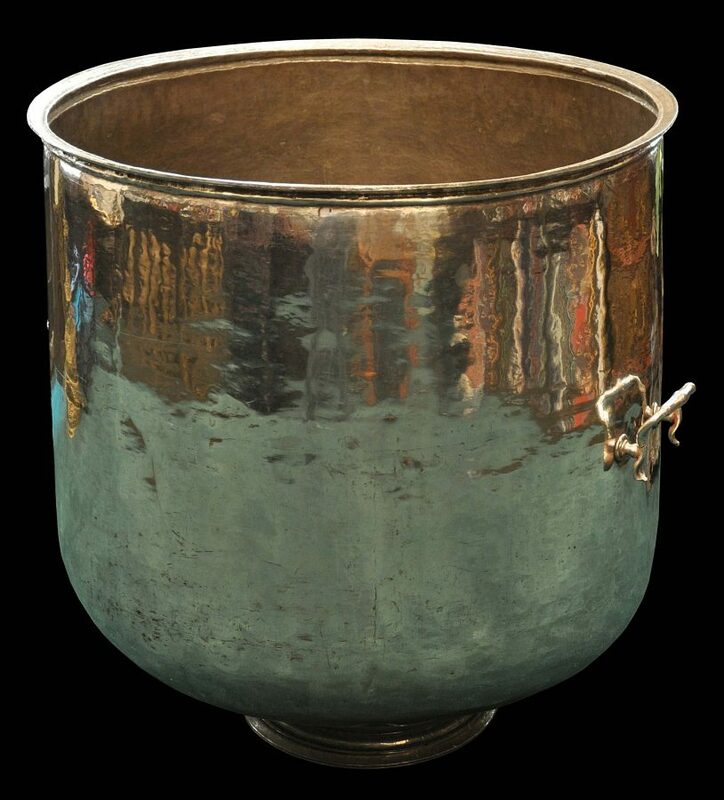 This massive water container is of solid, high-grade silver. In the past, it has been misidentified as a ‘Mughal bath’ but in fact it was constructed to hold River Ganges water for Hindu purification purposes. Most probably it was to hold Ganges water that was used for drinking. Silver was considered a ‘pure’ metal and thus appropriate for use in a ritual. 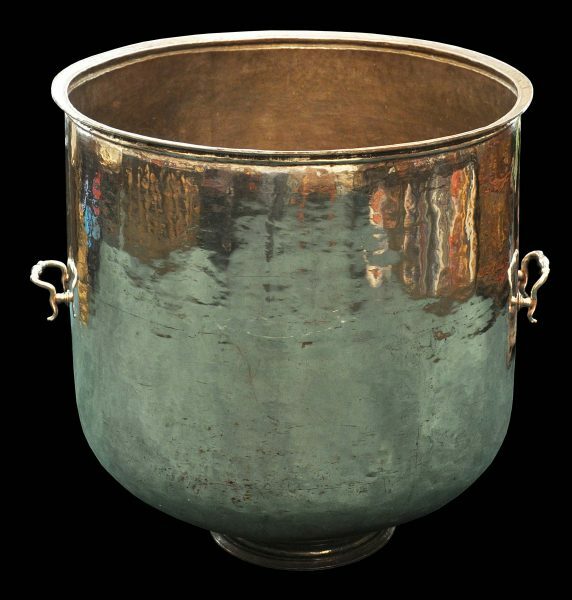 Such a vessel was most probably kept in a storeroom in the palace especially built for such storage, so that the water and food to be consumed by the royals, would be safe from possible spoilage and ritual contamination. The container has a rounded bottom and then straight sides that rise to a extended collar and inwards sloping rim. The collar and thickened rim appear designed to give strength to the structure of the container. They rim is built in such a way that suggests that there was no custom-made lid made for the container, certainly no fitted lid. 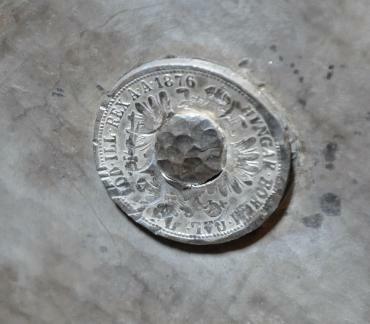 The container has a hole or drain at the bottom which is covered by a silver plaque chased with a flower motif and secured by rivets. Two solid-silver cast handles in the form of hooded cobras are attached to either side. 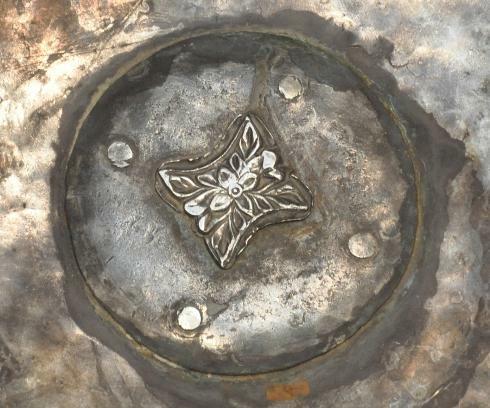 The handles are secured to the inside of the container with four silver Franz Josef Austro-Hungarian one florin coins, two of which have legible dates (1877 and 1876) and the other two which do not. 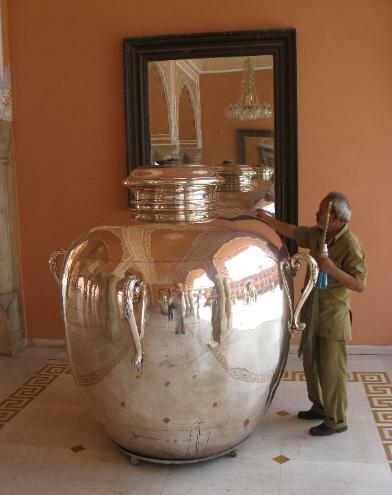 The container is analogous to two enormous silver lidded jars now on display in the City Palace of Jaipur, Rajasthan (see an image below). 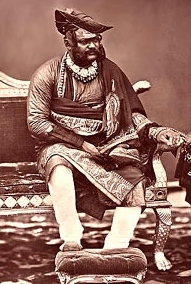 Maharaja Sawai Madho Singh II of Jaipur (ruled 1880-1922) attended Edward VII’s coronation in 1901 and brought with him four large silver urns each filled with around 9,000 litres of Ganga jal, sacred drinking water from the Ganges. Silver was the necessary material of manufacture given the sacred nature of the proposed contents. One of the reasons for bringing Ganges water to Britain was on the advice of religious advisors: traditionally, Hindu strictures prevented Hindus from crossing the sea or kaala-pani(‘black water’) and to do so would result in one losing one’s caste. Eventually, pragmatic dispensations were found to get round this problem. Among the rules that the Maharaja (and possibly other Maharajas) were advised to follow to preserve their caste was to only drink Ganges water whilst abroad. The Jaipur jars were made by two local silversmiths who melted 14,000 Jhar Shahi, coins issued by the Kapatdwara treasury of Jaipur State. The coins were melted and the resulting silver ingots were beaten into sheets of silver. The sheets were then beaten over a wooden mould that was in the shape of the jars. The process was commenced in 1894 and took two years to be completed. The jars were not made specifically for the Maharaja to take to England for Edward’s coronation, as they were completed in 1896, several years before the Maharaja knew he would be travelling to England. Instead, they were intended for use at the Palace to hold Ganges water. The container is believed to have come from the Jai Vilas Palace, Gwalior. The Palace was completed in 1874. The container was made (probably) around 1880 so perhaps was commissioned for the relatively new palace. It would have been made during the rule of Jayajirao Scindia, the Maharajah of Gwalior (1835-1886). The Maharaja was considered a friend of Britain and was created a Knights Grand Commander of the Order of the Star of India. The palace itself was one of the most opulent in India and famously has a miniature train made of silver which ran around tracks on the main dining table delivering post- dinner brandy to diners. The Prince of Wales stayed in the Palace in 1876. The container first appeared on the market in the UK when it was sold by the Hobhouse family, whose country seat was Hadspen House in Somerset. Arthur Hobhouse, who was awarded the title the 1st Baron Hobhouse (1819-1904), was appointed in 1872 as a law member of the Council of the Governor General of India. He also served as Vice-chancellor of the University of Calcutta. He left India some time after 1877. 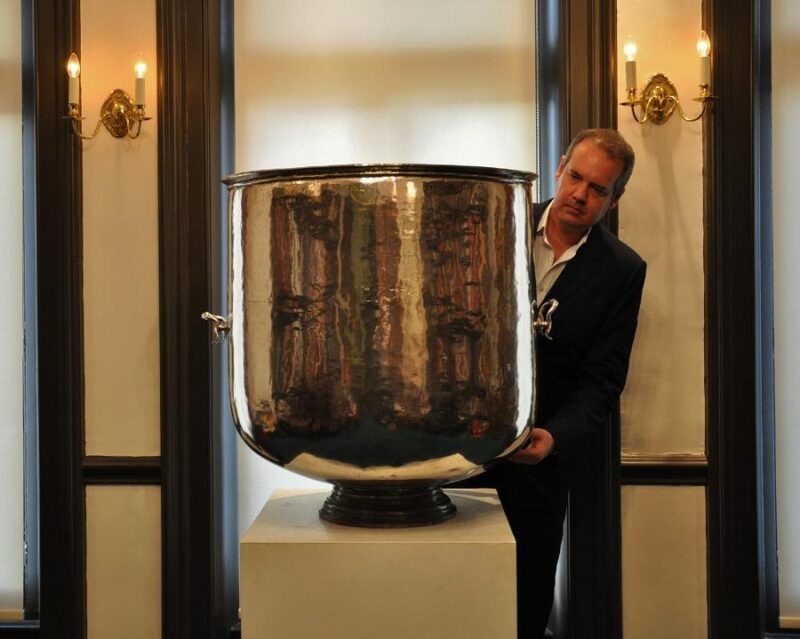 It is possible that Hobhouse acquired the silver container on his departure from India. Alternatively, it is possible that a maharaja brought the gangajali to England to attend a coronation or royal jubilee and then left it in England. The container is in fine condition, has an excellent patina and is without any repairs. Most probably, it is the largest piece of Indian silver currently available for sale in the world today. It sits freely on a later custom-made stand that is of wood covered with sheet silver. Overall, it is of monumental proportions, is an outstanding museum-quality item with sound provenance, and is exceptionally rare. the last two images show Jayajirao Scindia, the Maharajah of Gwalior, and one of the large silver gangajalis at the City Palace Museum, Jaipur, photographed in 2011. Jaffer, A., Made for Maharajas: Designs for Princely India, Scriptum Editions, 2009.